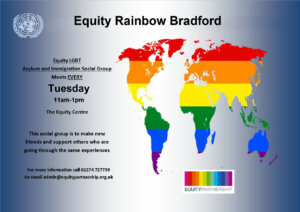 Over the Rainbow is a social group for LGBT people in Calderdale age 50+. Supported by Age UK Todmorden, the group meets every first Saturday in the month, 1pm to 4pm in Todmorden library. The venue is accessible. They have also begun to show LGBT films in Todmorden library the third Saturday of the month, 1pm to 4pm which are open to everyone. This is usually followed by a discussion on the film. An inclusive LGBT running club for all levels. Meet at Lakeside Café, Roundhay Park each Saturday at 9am. For more details visit their Facebook page at https://www.facebook.com/groups/204732556270960/events. Transpennine is a large and highly active GOC group based in the North of England. They organise a large selection of interesting walks and cycle rides of varied length and hardness. Most walks are held on Sundays. In the summer they also arrange some short evening walks followed by a social drink. For the more adventurous they have monthly hostel or camping weekends where members can socialise and enjoy visiting areas further afield such as the Lake District and North Wales. More information can be found on their website at: http://www.goc.org.uk/groups/transpennine. Yorkshire Terriers were one of the first gay-friendly teams to be founded in the UK, back in 1997 and were a founder member of the GFSN National League at the start of the 2002/3 season. They also host the annual five-a-side Yorkshire Tournament which is one of the most eagerly anticipated events on the GFSN calendar. Further information can be found on their website at: http://www.terriersfc.co.uk. Wayward Women is a lesbian walking group for most ages. Walks range from 7 – 12 miles, generally in the West Yorkshire dales and moors but also in North or South Yorkshire – occasionally even in Lancashire. All walks are on Sundays, usually every two weeks, and most are circular. Walks leave the start point at 10.30am. For more information about walks and who to contact please visit the Wayward Women website at http://waywardwomen.webs.com. Halifax Gay Group meets every Wednesday evening at 8pm. Many of their events are based on popular TV quizzes and game shows; the aim is to have a good night out and a laugh with other gay men. For more information, visit their website at http://hagg.org.uk or contact Mike on 01422 375307 or by email at mike@hagg.org. Huddersfield Gay Group is a friendly social group for gay and bisexual men, aged 18+, which meets at 7.30pm, every Tuesday in Huddersfield town centre. This group offers a chance to meet new people, have a chat and catch up on the week’s gossip. Coffee, tea or soft drinks are available from 30p. For more information, visit their website at http://www.hugg.org.uk. T-Boys is a Yorkshire-based support group for anyone assigned female at birth who identifies as male/masculine, or is questioning their gender. Meetings usually run the third Saturday of every month. Details can be found on their website. They can range from social activities to more constructed meetings on a specific aspect of transition, such as hormone replacement therapy (HRT) or surgery. To get in touch phone 07563 233403 or email tboysuk@yahoo.co.uk. Alternatively, visit their website at http://t-boys.co.uk. Transtastic is a youth group based in Leeds City Centre, offering support for young people aged 13-18 who are transgender or confused about their gender identity. The group offers the chance to meet new, like-minded young people and get involved in fun activities within a friendly environment. If you would like to know more or would like to join, please contact Stacey Robertson on 07891 271043 or Sam on 07712 214421. The Leeds Trans group for 13-25 year olds. Sessions run the last Tuesday of the month and take place at Tavistock Leeds Base, 14 Park Square East, Leeds LS1 2LF. For further information please contact Gendered Intelligence on 07540 261104 or go to their website: http://genderedintelligence.co.uk/trans-youth/Leeds or their Facebook page https://www.facebook.com/GenderedIntelligence. BLAGY (Bradford Lesbian and Gay Youth) is an informal and fun group for young people between the ages of 14 and 25 who identify as lesbian, gay, bisexual or who are questioning their sexuality. The group meets weekly from 6pm to 8.30pm in a safe city centre location and the sessions are varied and young person led. They also meet once a month in Keighley on the second Thursday of the month. Identity is a weekly LGBT youth group in central Halifax for 13-21 year olds. The group offers 1 to 1 confidential support and advice to all young people regarding sexuality and gender identity, home and school concerns, and any other worries they may have. They are based in a secure location in Halifax town centre that offers a safe environment for young people to meet every Wednesday from 5.30pm to 8pm. For more information email: identitylgbtgroup@barnardos.org.uk or visit their website: http://www.identitylgbtgroup.com. Yorkshire Mixtures is a youth group for lesbian, gay, bisexual and transgender young people. There are lots of activities are available including sport, music, dance, drama and art. For more information, contact Oliver Gareis on 07528 988883 or visit their website at http://communitydirectory.kirklees.gov.uk/communityDirectory/eventdetails.aspx?eventid=16272.